100911 - Everyone up and back to the baseball field for D's baseball game. 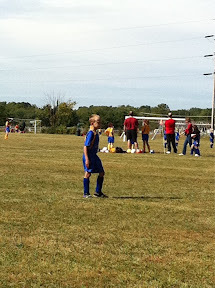 After the second inning J&I got Lilly and headed to J's first soccer game of the Fall season. Jack did pretty good and his team won. Then J, Lil and I headed to Meijers to get football party supplies. We grabbed some Wendy's on the way home. Back home and got the report that D's team won today, but D struck out looking each time he was up today... Everything ready and our friends, the Varneys, came over to watch the game and eat and eat. All the kids played together pretty good and it was a good time and a good game. Got the boys cleaned up. Watched some more football and playing with the new iPhone 4.